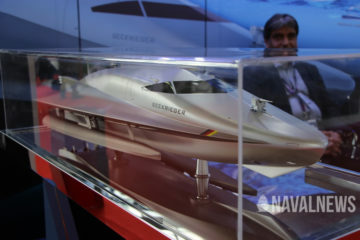 Echo Voyager scale model on Boeing's stand at SNA 2019. While Echo Voyager and Orca XLUUV are not the same vehicle, lessons learned from Echo Voyager have been incorporated into Boeing's Orca design. Naval News picture. The Boeing Orca Extra Large Unmanned Undersea Vehicle (XLUUV) team submitted its proposal on Dec. 7 for Phase II of the U.S. Navy’s Orca competition, and is pleased to offer a reliable, multi-mission capable solution to meet unmanned undersea mission needs. We look forward to supporting the Navy in the development of this important capability for the nation. 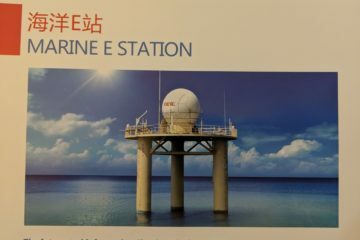 Slide from the “Unmanned Maritime Systems Update” by PEO USC / PMS 406 shown during SNA 2019. During a briefing held during SNA 2019, CAPT Pete Small, Program Manager, Unmanned Maritime Systems (PMS 406), showed that the Orca program will focus initially on Concept of Operations (CONOPS) development, payload integration work and mine warfare (MIW). 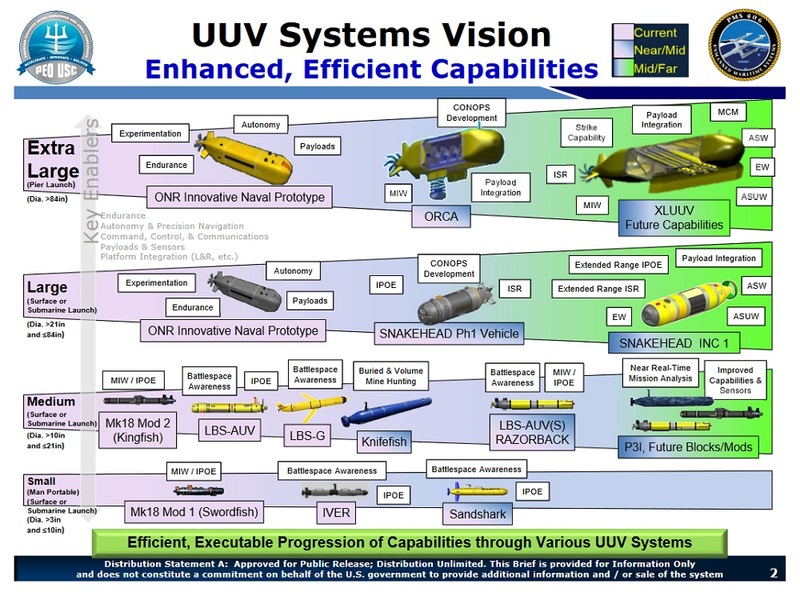 However the above slide shows that XLUUV future capabilities may include mine countermeasures (MCM), anti-submarine warfare (ASW), electronic warfare (EW), anti-surface warfare (ASUW), intelligence, surveillance, reconnaissance (ISR) and even strike capabilities. Boeing Echo Voyager is 15.5 meters in length (with a diamater of about 2.6 meters). Its range is 6,500 nautical miles and it can stay for “months” out at sea. It was designed to be fully autonomous and can accommodate both internal and external payloads. Boeing picture. 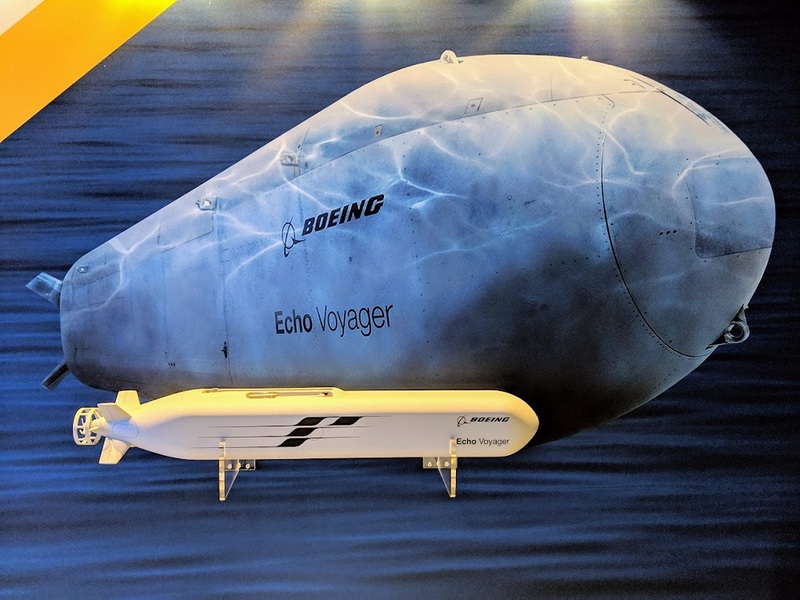 At SNA 2019, Boeing was showcasing an Echo Voyage UUV scale model. While Boeing stressed that Echo Voyager and Orca XLUUV are not the same vehicle, they did say that lessons learned from Echo Voyager have been incorporated into their Orca design to improve reliability and reduce risk. 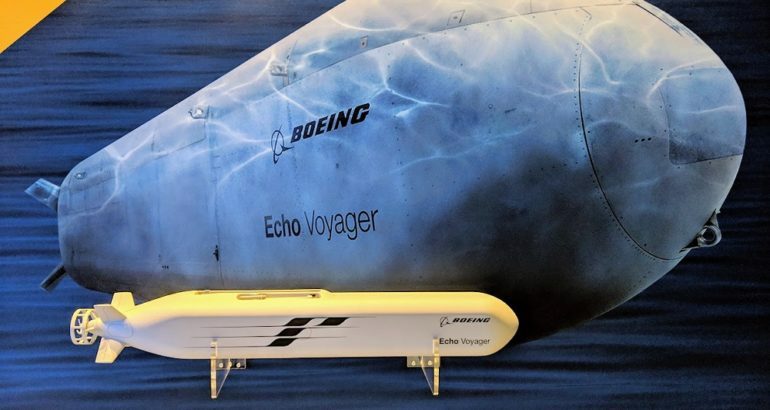 Echo Voyager is a Boeing-funded commercial prototype that is built on 50-plus years of UUV experience and has more than 1900 hours of ocean testing. Echo Voyager was designed and built at a Boeing facility in Huntington Beach, Calif. The vehicle completed its first phase of sea testing (or Alpha sea trials) last year when it operated off the coast of Southern California for about three months to undergo system evaluations and testing. 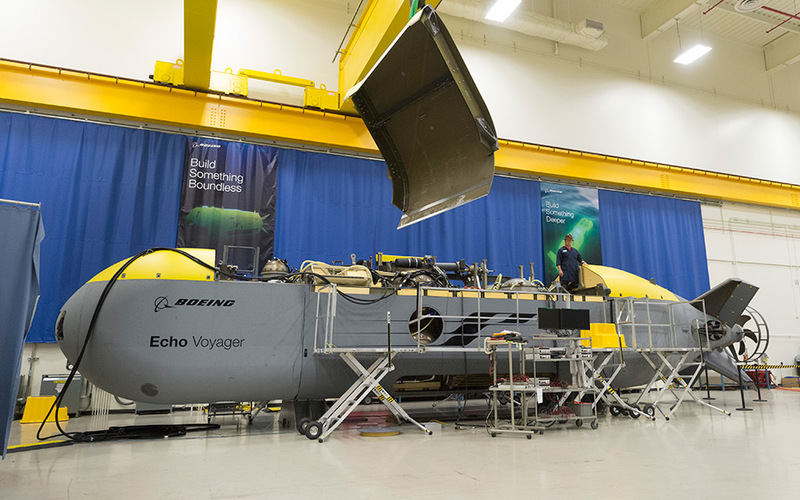 During that time, the Echo Voyager test team conducted a series of functional tests to verify Echo Voyager’s ability to operate on the surface, just beneath the surface and undersea. Ocean testing tasks included charging the battery, controlling the vehicle in currents and wave action, submerging the vehicle and returning to the surface. Echo Voyager returned to sea in early 2018 for Bravo sea trials, designed to expand the operational envelope from the initial test series. Boeing plans to resume testing this month following a brief pause in the Bravo testing while the company was awaiting additional hardware. The U.S. Navy selected in 2017 Boeing and Lockheed Martin to pursue the XLUUV program. The aim of the program is to develop and integrate a pier-launched unmanned system that operates completely independently of manned ships. XLUUV prototype contracts are expected to be awarded in early this year.